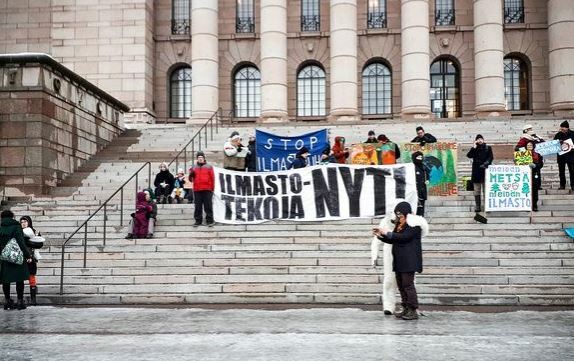 Finnish anti-Global Warming nutcases yet again on the steps of parliament……. – The Tundra Tabloids……. So far there has been a low-key response in Finland. A few hundred high school students protested on the steps in front of Parliament in January. Other Fridays have brought a few dozen activists with banners and signs, mostly adults. A larger event is planned for 15 March. Stopping by to support this week’s demonstration were fourth graders from the Helsinki suburb of Kulosaari, who were on a field trip to Parliament House. Also on hand was someone in a polar bear suit offering hugs to passers-by and inviting them to join in. Previous Post Previous Post UK: Tommy Robinson and colleagues turn the tables on the BBC’s fake news/smear attempt on him…….